NOW AVAILABLE. It is a revised and updated edition of Fisherman's Coast, and includes three new chapters - Tides, How Fish Use Sight and Sound, and Stewardship - and new photos and figures. Book Description from the Publisher: Aaron Adams, Ph.D., a marine biologist who fly fishes, figured out what was missing from saltwater fly fishing and frustrating saltwater anglers. The Orvis Guide to Fly Fishing for Coastal Gamefish is the first and only book that follows the freshwater tradition and educates saltwater anglers about the fish they pursue with a fly rod. Adams presents information on coastal gamefish behavior and diets, the habitats they use, when and where they eat different prey, the best locations and times to fish for them, and much more. For centuries, trout anglers have known how to match the hatch. Now saltwater anglers have their own reference – not only for matching the prey most eaten by gamefish, but also how to interpret coastal environments to put themselves in the right place at the right time to catch more fish. There is an old saying “10% of fishermen catch 90% of the fish” – The Orvis Guide to Fly Fishing For Coastal Gamefish is your path to joining that 10%. Even those already in the top 10% will learn from this book. 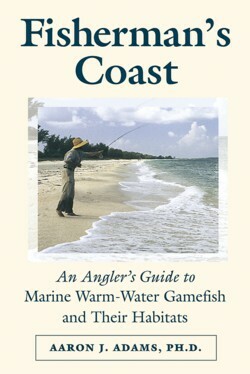 If you fish warmwater coasts – from the Caribbean to the Carolinas and the Gulf of Mexico – you will benefit from this book. But so will anglers who fish more northern coasts. 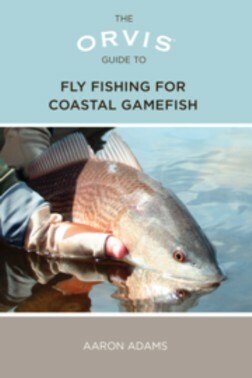 The book has fishing tips for 25 marine gamefish and their prey including: red drum, spotted seatrout, permit, bonefish, snook, tarpon, barracuda, snapper, ladyfish, weakfish, bluefish, striped bass, cobia, cero mackerel, Spanish mackerel, and jacks. Use the PayPal button on the right to order your signed copy today. You can use a credit card or PaPal account. If you prefer to not use PayPal, you can pay by personal check, Please email me for instructions - books@fishermanscoast.com. 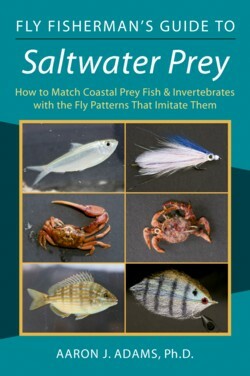 Fly Fisherman's Guide to Saltwater Prey is the complete reference for matching coastal prey fish and invertebrates with the fly patterns that imitate them. Photos of gamefish prey, information on the habitats, locations, and seasons the prey are most likely found, and photos and recipes of the flies to imitate them help you create, tie, and fish the flies. The focus is on fly fishing for coastal gamefish in warm-temperate, subtropical, and tropical regions. Order the book by using the PayPal button to the right (you can use a credit card of PayPal account). Book Description from the Publisher: Marine researcher Aaron Adams shares his knowledge about sea grass, mangroves, salt marshes, oyster bars, shorelines, beaches, sand flats, and coral reefs from the Caribbean to the Carolinas, the Gulf of Mexico to the Florida coast, to give you what you need to know to fish for tropical, subtropical, and warm-water species. Behavior, life cycles, and fishing tips for 25 marine gamefish and their prey are included. Species include red drum, spotted seatrout, permit, bonefish, snook, tarpon, barracuda, snapper, ladyfish, weakfish, bluefish, striped bass, cobia, cero mackerel, Spanish mackerel, and jacks. “probably the first book an academic has written that aptly transcends that fine line between formal writing and useful readability for the fly-angler. His analysis of the predatory/prey relationships at work in the various habitats, coupled with discussions of fly selection and fishing strategies, is outstanding.” Mark Rumph, Fly Fishing in Salt Waters magazine. “Many fishing books promise authoritative coverage on a variety of techniques or locations, but this book…delivers the detail.” Michael Koehn, Los Angeles Times. This book was taken out of print by the publisher, Stackpole Books, in 2011, so is now a collector's edition. Used copies are for sale on Amazon and other vendors, but the price for used copies keeps going up, so don't delay. Book Description from the publisher: Called the ghost of the flats, the silvery bonefish is the holy grail of flats fishing. Its speed in the water and chameleon-like color make it the ultimate challenge to catch, and because of its elusiveness, much of the joy of bonefishing is in searching for the fish. Finding bonefish from a skiff and while wading are thoroughly covered, as is catch-and-release. Details on the bonefish's environment and its food provide the essential background, and you'll learn what tackle and flies to take and how to cast efficiently on the flats. What others are saying: “Far and away, Fly-Fishing for Bonefish is the finest single-species book that has come across my desk to date.” Mark Rumph, Fly Fishing in Salt Waters magazine. “This book is a thorough how-to on fly fishing for bonefish and other flats species…(and) is valuable reading for all beginner to expert fly fishers who have a craving for these adventures.” John Randolph, Fly Fisherman magazine. "If you’re a novice bonefisher, buy this book before you read anything else. If you’re a hard-bitten wrangler of bonefish around over the world, you’ll be pleased and enlightened. 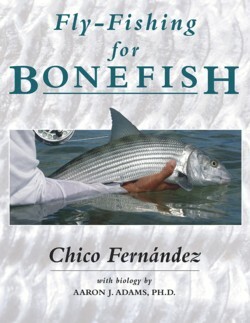 As Sandy Moret says in the introduction to the book, “What we always seemed to agree on is that there are no tricks, no gimmicks, and no instant-pudding mixes for catching bonefish.” Chico Fernández has come closer than many will come for a long time." Marshall Cutchin, Midcurrent.com. The Fisherman's Coast approach focuses on how coastal gamefish interact with their habitats and prey. The more you know about the gamefish you pursue with a fly rod, the more often you'll be in the right place at the right time with the right fly making the right presentation. It's about catching more fish. Our sister site Tribal Bonefish is all about conservation through responsible fishing. Tribal Bonefish shows you how to become a better steward of our coasts to protect our fisheries today, and ensure future generations get a chance to experience these fisheries. You can buy these books directly from the web site by using your Paypal account, your credit card (with Paypal as the processor), or by check. To pay online, simply click on one of the icons below. To pay by check, please send an email to books@fishermanscoast.com for details. All books will be signed by Aaron Adams.